2_상품가 전액 법인카드 및 개인카드 결제 가능. 3_아시아나항공 베니스 및 로마 관광일정과 로마에서의 시장조사 일정 포함. 4_아에로플로트항공 밀라노 및 모스크바 관광일정과 시장조사 일정 포함. 이탈리아 볼로냐에서 개최하는 COSMOPROF는 유럽 최대의 미용산업 전시회 입니다. 빠르게 변화하는 미용관련 트렌드를 가장 먼저 체험할 수 있는 기회의 장이 될 것 입니다. 포장전시회(COSMOPACK) 및 헤어&네일&전문샵용품전시회를 병행하여 참관하실 수 있습니다. Fragrance, skin care, toiletries and accessories. 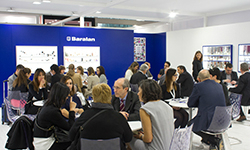 Pavilions 22 and 26 are dedicated to international fragrance companies. Cosmoprime, which is located in pavilion 14 for the first time, brings together the premium brands in fragrance and cosmetics, with high-end products that stand out for their refinement and excellence. This area includes interesting companies with masstige and prestige products along with four special areas that highlight an innovative, green focus in line with the latest trends in the beauty world. This is the temple of green beauty, with a selection of fragrances and cosmetics meant for the retail channel. For years now, pavilion 21 has hosted the most popular companies and products in this area for the retail world. New solutions, new textures and products that offer even greater performance are showcased one after the other, paving the way for the trends of tomorrow. 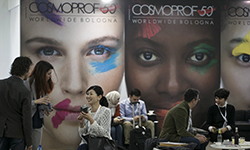 Cosmoprof is the only trade fair that recreates the manufacturing process of a cosmetic product, showing it live during the event thanks to the participation of a selection of Cosmopack exhibitors. Cosmetic products, machines and equipment, furnishings and pieces for beauty centers, spas and hotels, tanning (equipment and products) and cosmetic medicine will be the highlights in the new pavilions 28, 29 and 30 dedicated to beauty and spas. Thanks to promotional initiatives carried out in international markets, companies from Eastern Europe and the Balkans, especially Russia, Latvia and Lithuania, are showing a greater interest in participating in the show. 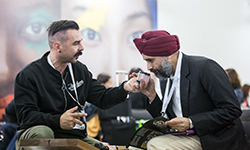 Nails are the absolute stars of the show in pavilion 36, the historic location for the industry, with international companies displaying products for nails, professional cosmetics for reconstruction and manicure and pedicure treatments, accessories, equipment and services. Hair sector as well : 25, 31, 32, 35 and : new for the 2019 edition : 37. This area is seeing a growing number of Italian companies, testifying to the important reawakening in the domestic market. Cosmoprof will be on worldwide barber techniques. And there’s something new for 2019: a dedicated pavilion : number 35.